Katrin looks after innovations and product developments in the roofing and cladding sector. Working predominantly under New Zealand Steel’s COLORSTEEL® brand to explore product improvements that can offer market differentiation. A prime example of this being their new COLORSTEEL® DRIDEX® product. It offers an anti-condensation solution that features a layer of fleece to collect, store and release moisture for drier healthier infrastructure. So far, it’s been Katrin’s most memorable project. Allowing her to better understand markets the products are being sold into, and the challenges associated with it. For her it’s been a busy but rewarding project full of positive market feedback! New Zealand Steel is the sole producer of flat rolled steel products for the building, construction, manufacturing and agricultural industries in NZ. Using locally sourced ironsand to produce around 650,000 tonnes of steel a year. Katrin, tell us about your career to date. I got my foot into the ‘metal industry’ door after my PhD. 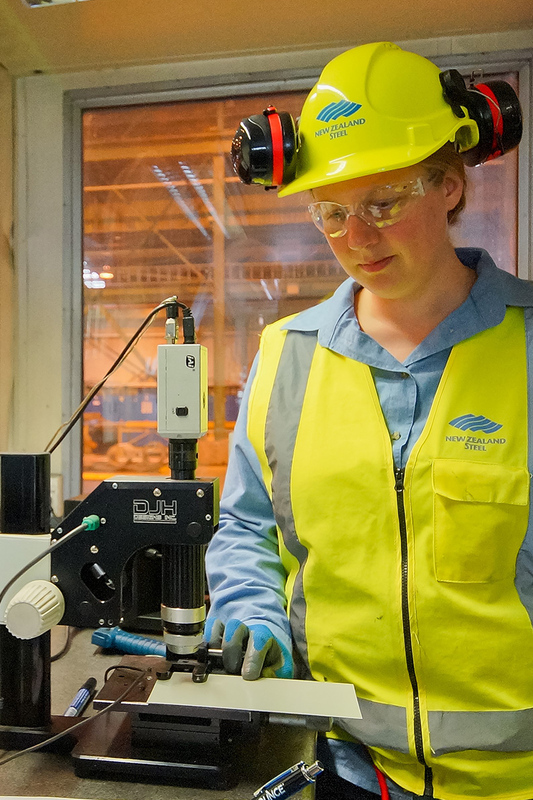 My role at New Zealand Steel was initially funded under a Callaghan Innovation grant. My role started with a focus on science but has since transitioned to a more business oriented one – although the science part is still very much there! I love the diversity and challenges my work brings. I never sit still or get bored. What has got me through my day to day responsibilities is good project management skills. The ability to multitask, keeping a high-level overview when working on details, and selling new ideas internally being a big part of that. I also think it’s important to motivate others and stay motivated yourself. During difficult times it can be easy to give up – but I believe my PhD has helped me with this and more. New Zealand Steel Product Launch Manager - Roofing & Cladding, Katrin Schüenemann. How do you find the environment you work in? It’s a pleasure. Especially when you can successfully get buy-in from everybody and motivate them to do something outside of their ordinary day-to-day job! To me, if you’re able to keep your eyes and mind open to changes and challenges, you’re always going to find a career like this rewarding. Your environment will always be good too, if you’re the best person with the right qualifications and people skills. It should never be a matter of gender or any other differentiator. That’s why I think it’s important that a certain balance should be maintained automatically. There’s no such job where only men or women can participate. Both genders should be the right fit if they have similar skills. But, there is room for improvement. A job advertisement can be written in a way that is attractive to both gender pools. It diversifies the applicants an employer can choose from. This could be as simple as emitting masculine terminology. Or, avoiding stating requirements that more men are likely to have over women, such as fork lift licences. For any women thinking of following a similar career path as mine – ensure you’re open to possibilities. Please don’t narrow your career path too much. Doing so could be the thing that costs you an opportunity that leads to a great career!